No more Lego museums, fun to knock down and play with again! And, pleasant to step on in the dark! This 88 piece set of magnetic blocks comes with plenty of shapes to really get creative! We bought this for our 3 year old grandson. 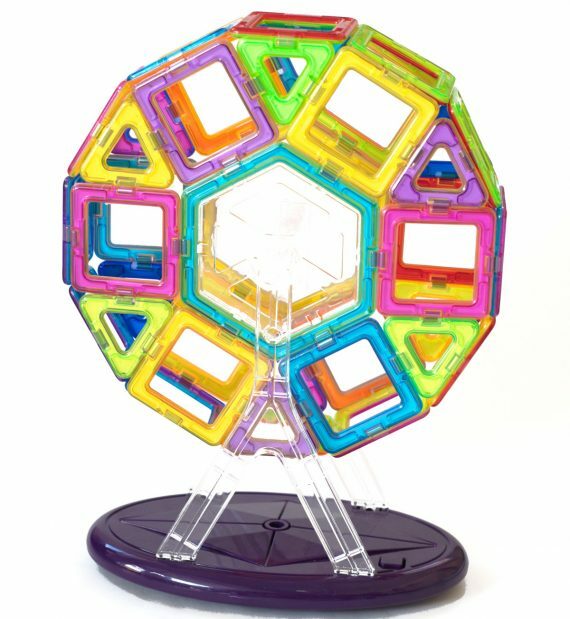 My daughter (his mother) has said he loves it and since he is coming to visit, we ordered a smaller version to play with while he’s visiting for spring break. But it must be good because my son-in-law went looking for other pieces to buy. I like the idea of the tote to keep the pieces together and neat. Nothing is worse than a pile of toy pieces in the bottom of the toy box. 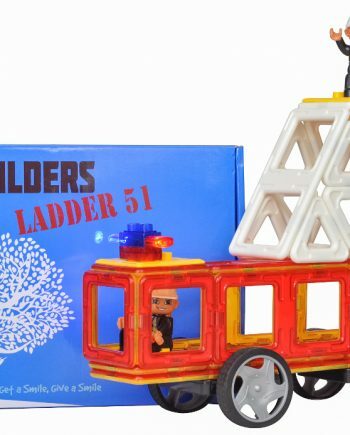 This toy is fantastic for kids. But some pieces were missing , such as the yellow squares. Nine yellow squares were missing???? Not good! Work as expected, like carrying case and options. missing the ferris wheel parts… had to return. 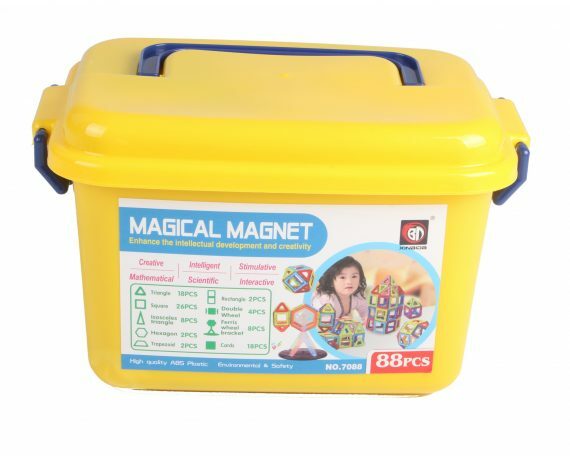 The Magnetc Tiles set was sent overseas to my grandkids as a Christmas gift. Grandkids are 6 and 3 years old. They absolutely love them! They build and rebuild. My daughter in law wrote and said they don’t have to assist in “fixing” anything back to its original state like other toys. Additionally, it even keeps the adults very well entertained. A little hard for the younger ones. Very entertaining for our granddaughter. We love this toy! We received it at a discounted price for an honest review. I honestly wasn’t thinking it would be that great, but they are! I am thinking about buying a second box to add on to it with! Kept my four kids busy for hours tonight! 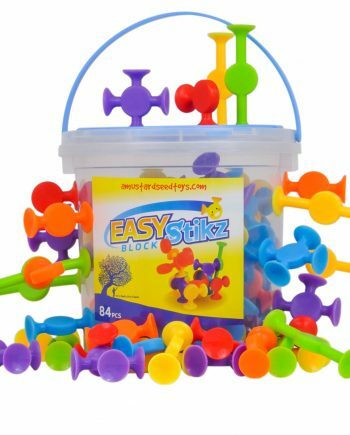 I purchased this product for my 2.5 year old twins, so I knew from the start it was likely a little ahead for them, but had seen them play with something similar at their friend’s house so took a chance. 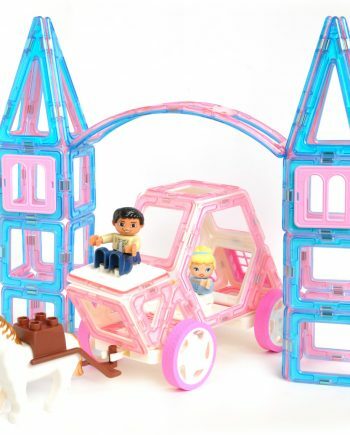 Overall I think this is a good product, 3 days later and they still have my twins’ attention and I have enjoyed building with these too. Love the varied pieces you get and what you can build with them – a great starter set for anyone thinking of buying such a product. Unfortunately, the girls broke one of the stands to the ferris wheel part on the first day, but that is what you get when you let a 2.5 year old play with that part – hoping I will be able to glue it and use it when they are older. 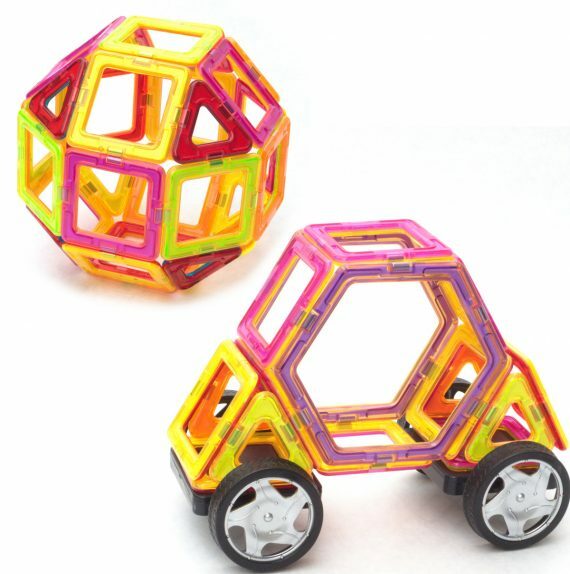 I would have given this 5 stars but do feel the magnets need to be a little bit stronger, particularly on the wheel bases – I have made countless cars and the wheels easily fall off with even the gentlest of pushing. As my twins age they will hopefully become a little more careful making this less of an issue. What is great is that you get 4 wheel bases with this kit which means I can build a car for each twin – essential for a happy household! 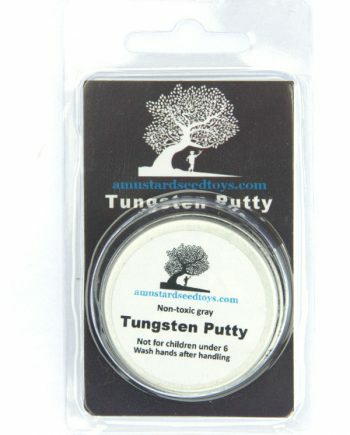 I received this product at a discounted price for my honest review. Chose this set for my granddaughter. Had a couple of pieces missing upon receipt. Not to worry. 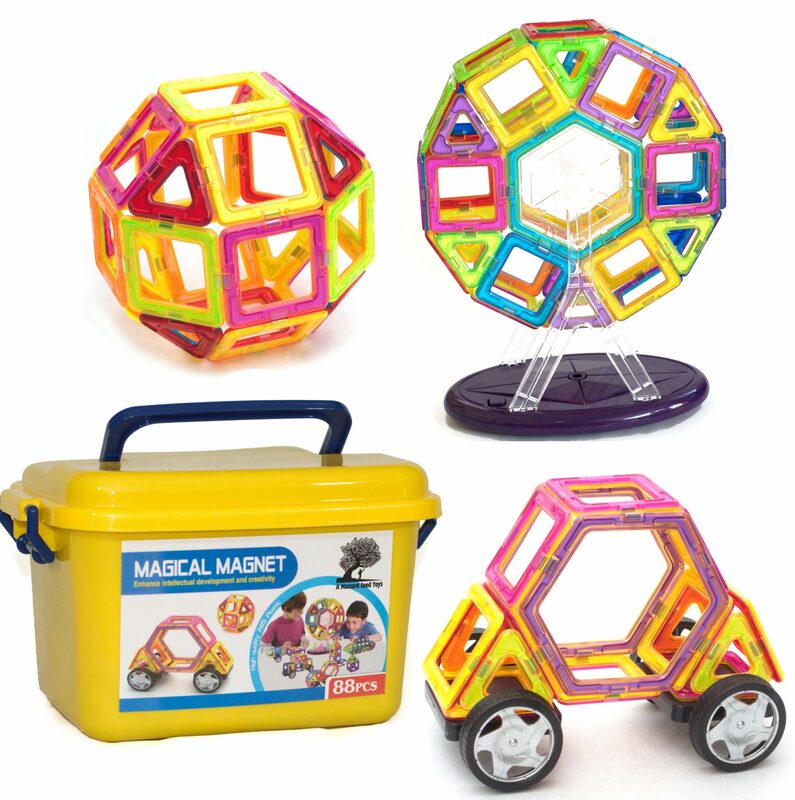 Reached out to Mustard Seed Toys and Jen expedited the missing pieces within a few days. Set is completely engaging. My grandson loves this! I bought this and the smaller kit so he would have plenty of pieces for his mom and dad to help build items. 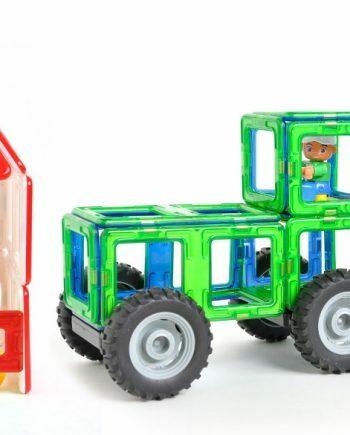 They made the Ferris wheel and a truck the first day! Great product! These are just as good as the expensive ones. We got magformers from the stem club and needed more. My boys 2, 3, and 5 play with these a lot! My only complaint is the tires. the vehicle they made collapses if they try to cruise it around. When a “masterpiece” falls apart I hear crying and frustration. So, if the magnets on the tires were stronger maybe car creations can be rolled or moved. Great product! Nice variety of shapes and different building options. The container is wonderful for storage. The ferris wheel and the music it plays are absolutely precious! We chose this set to add on to the 40 piece magnet set from A Mustard Seed Toys that we purchased about a year ago. The magnets have been used to build multiple creations by our kids. 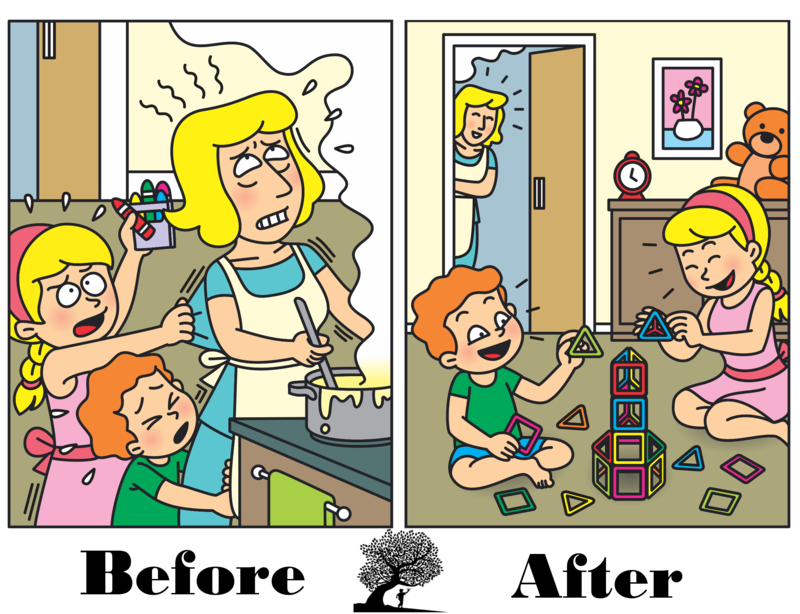 We have also used the tiles to help teach our kids shapes. 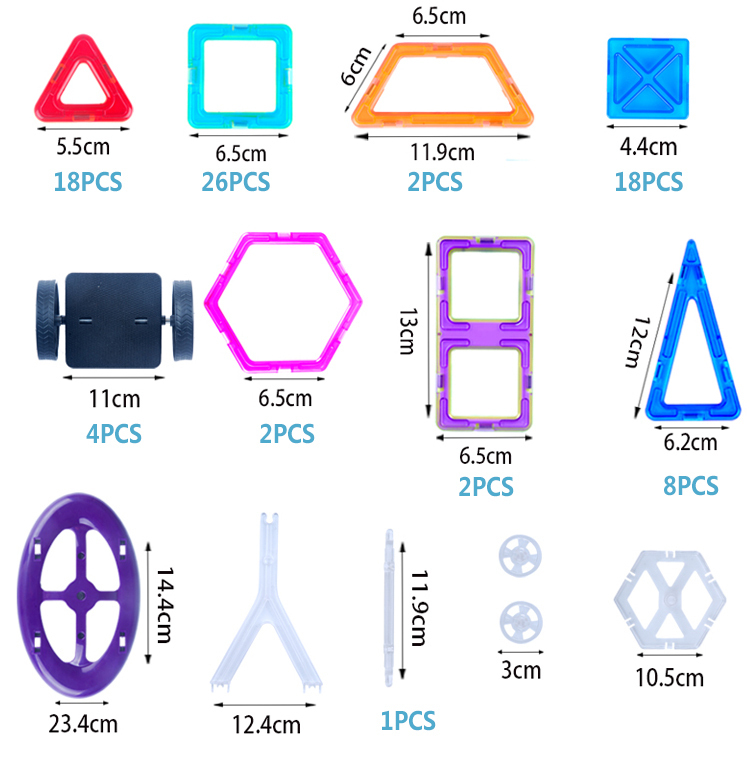 The magnet tiles are good quality and “stick” to each other great. If you are looking for a magnetic tile set, you won’t be disappointed with these. These magnets are getting a lot of use in a kindergarten class. 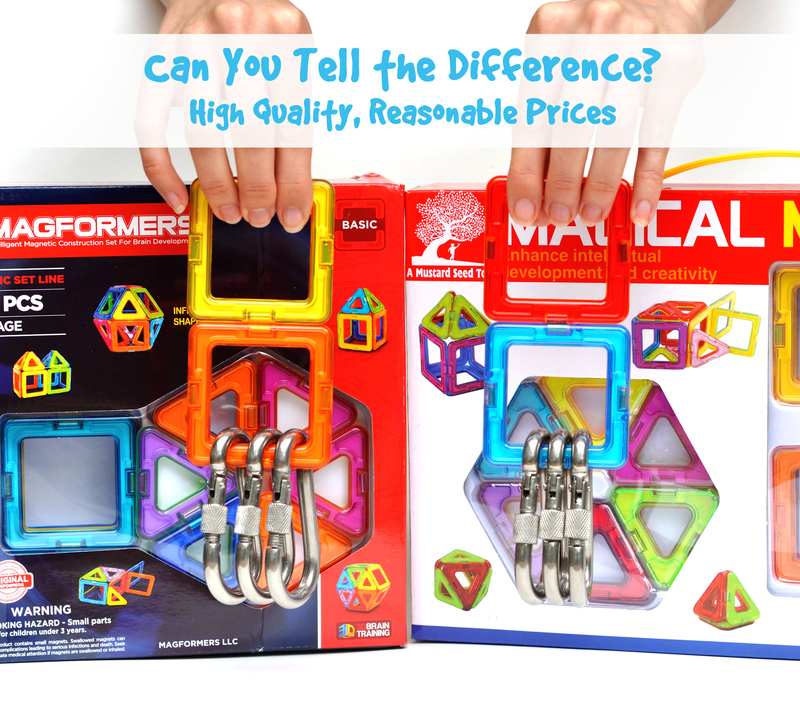 I have both Magna Tiles and this brand, and both are great quality. The price for these are much more reasonable and the carrying case is a total bonus. I knocked a star off because instructions did not come in my set. I had to contact the company on Facebook and here to get a very simple print out. 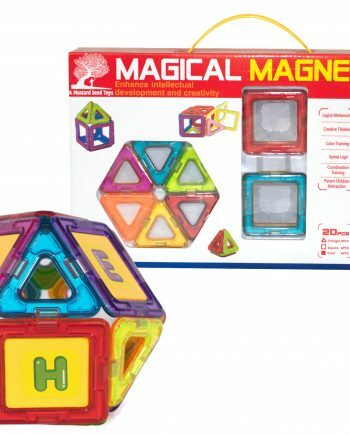 We received these as a gift and they work very well with the other brand of magnet toys that we have. They are a little thicker but they stick and hold without problem. Also the company gets an A+ for customer service. We contacted the seller because one piece was missing and she replied right away and sent a replacement and added in some extra tiles as well. They arrived within a couple days of contacting her.